I guide on the East End, (Big Bay) area of Lake Vermilion. Lake Vermilion is home to abundant populations of a wide variety of fish  northern pike, perch, crappie, sunfish, large/small mouth bass and musky. But, if Walleyes are what youre looking for, youve come to the right guide. Nothing tastes better than fresh Northern Minnesota walleye. 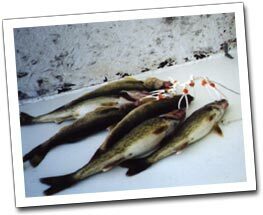 Join me for a fishing trip for walleye on Lake Vermilion in northern Minnesota. Book early as my schedule is filling fast. May through October  September and October usually produce the bigger walleyes. Mornings and evenings are usually the best fishing time, but the mid-day bite can also prove to be very good. The average walleye on Lake Vermilion has been running at approximately 14 to 17 inches long, but the chance of a real wall hanger is feasible. They are out there! Limits are common on most outings. Lake Vermilion is located 90 miles North of Duluth, Minnesota, 220 miles north of Mpls./St. Paul. The lake stretches 35 miles across Minnesota's Arrowhead Region.